Sensory Overload tracks the development of Kinetic and Op art, whose optical stimulation and interactivity introduced new dimensions to art. Stanley Landsman's Walk-In Infinity Chamber (1968), which has not been on view for nearly fifteen years, together with Erwin Redl's dramatic Matrix XV (2007), a 25 x 50 foot LED installation, punctuate this extraordinary immersive experience. Chronological in its presentation, the installation begins with works by László Moholy-Nagy and Josef Albers, two Bauhaus instructors whose ideas stimulated the developments of these styles, followed by vibrant early Op art pieces from the 1950s and 1960s by European and American artists such as Victor Vasarely and Richard Anuskiewicz. The development of Albers' ideas into geometric abstraction during the 1970s is visible in the works of artists such as Al Held and Frank Stella, and the works of Peter Halley and Philip Taaffe and those of the so-called post-hypnotic artists such as Bruce Pearson and James Siena show the continuation of the optical tradition in the 1980s and 1990s. Select images, films, and videos will be projected in two black box theaters. The Museum has collected and exhibited new media art ever since 1967 when it co-organized Light | Motion | Space with the Walker Art Center, one of the first exhibitions on this form of art in the United States. Sensory Overload features some of the most popular works in the Museum's Collection as well as key works on loan from other institutions and private collections. 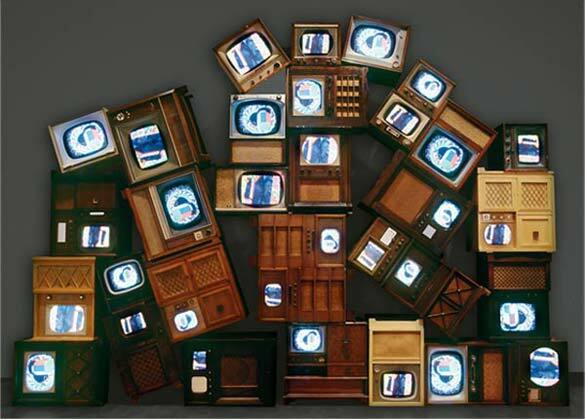 Nam June Paik, Ruin, 2001. 13 x 19 feet. Become a Museum Members today! Join Chief Curator Joe Ketner for a brief, informative tour of works featured in Sensory Overload.